While projections for future impacts of climate change on agriculture in large parts of Africa are dire, the mountainous areas of East Africa may benefit from warmer temperatures and an increase in precipitation (Niang et al., 2014). For example, farmers in mountain areas may be able to cultivate crops that have previously been unsuited to the area, such as maize, which has been limited by the low temperatures. A study by Thornton et al. 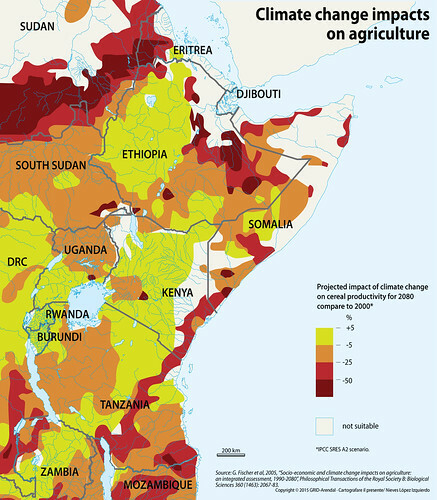 (2010), argues that, while maize yields will decrease in lowland Kenya, the highland areas are likely to become more favourable for maize. The study also identified similar results for highland areas in Burundi, Rwanda and DRC. The same is also true for livestock. While livestock farming is common in some parts of East Africa, it has generally been less successful in mountain areas due to the colder temperatures. This may change as temperatures increase (Thornton et al., 2010; Niang et al., 2014).